Below you find our guide how to make your own Pokémon Go Tracker of your entire neighborhood and how you use it to track any Pokemon that show up on your radar without having footsteps to follow. If you are looking for something that will find you that Snorlax 2 miles away, this isn’t it, but if you are looking for an eventual method to find that Snorlax that pops up on your nearby list in your neighborhood while the tracker is broken, this is it, assuming you put in some legwork ahead of time. Especially with the fall of all the Pokemon tracking websites we figured we should share what we did below. Document all Poke spawns and spawn times in your neighborhood via the slow or fast method described below for your own Pokémon Go Tracker. This requires creating a Google My Map that you add markers to. For those of you not aware, Pokemon spawn points spawn one Pokemon at the exact same time every hour. So if you see a Pokemon appear at 12:18, another Pokemon will appear there at the :18 minute mark every hour, 24 hours a day. That is the info you are collecting. 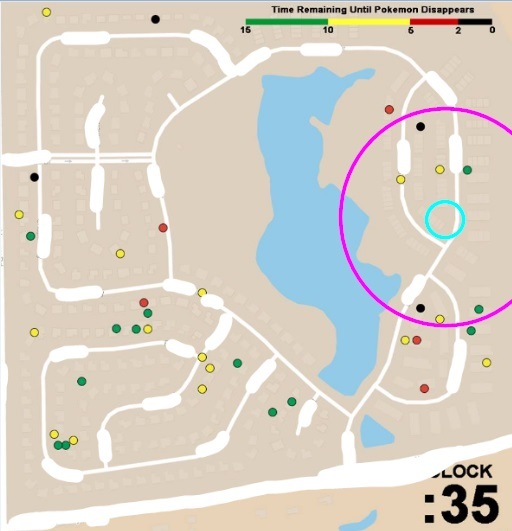 Obviously this is a very slow process, but if you plan to play this game for months, we estimate this wouldn’t take you more than a few hours over a few days to find a majority of your spawn points in your neighborhood. Obviously people are lazy and want a faster way, but this involves hoping Poke Scanner apps come back online which involves violating the ToS. 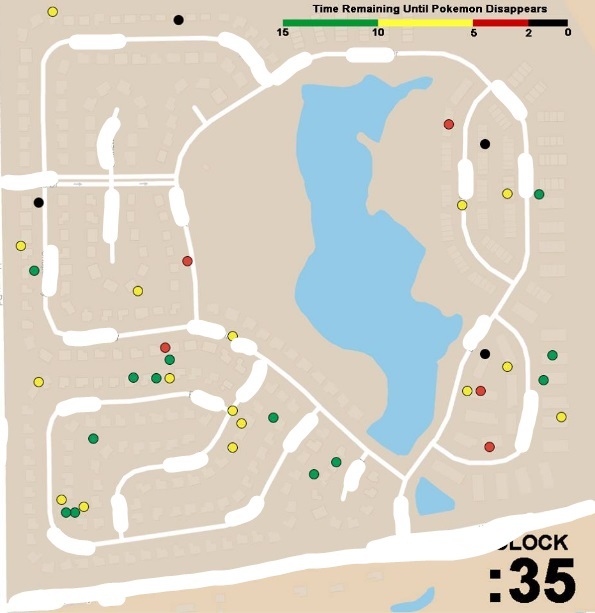 We spent 2 days collecting 50 spawn locations the slow way before finding out about Pokevision, and it took one night of scanning our neighborhood to find every spawn point, and knowing the exact spawn time. So until a scanner app comes back, you are stuck with the slow method to document. The map should be pretty self-explanatory as your own Pokémon Go Tracker, but what it is showing, is if it is 2:35 right now and we look at this map, we know exactly where every Pokemon in our neighborhood is and how long until it despawns. We made them in 5 minute increments (so have 12 maps total) as we think that’s the best time window vs total number of maps. How we made the Pokémon Go Tracker map above is pretty straight forward. First we decided what minute marker map we wanted to make first, in this case the :35 map. 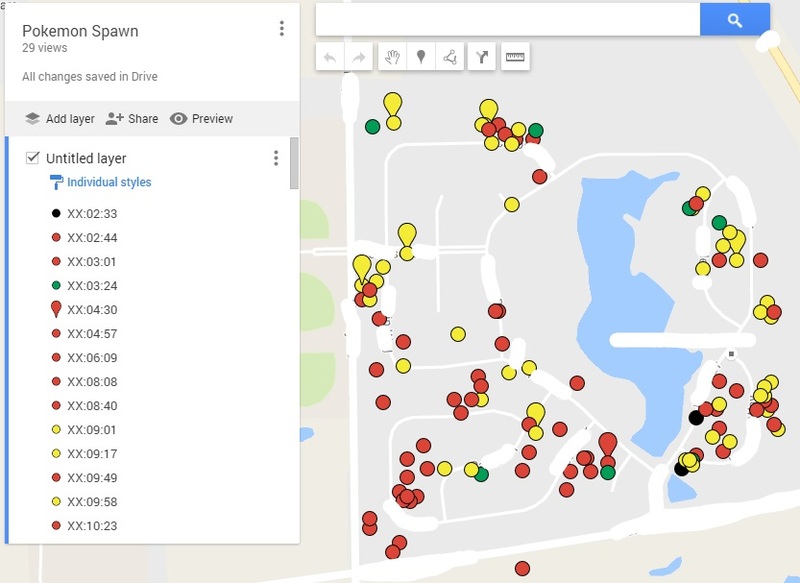 we duplicated our Google My Maps spawn map and deleted out all the points that didn’t fall between :20-:35 (since Pokemon only spawn for 15 minute increments, anything before the :20 mark is already gone), next we colored every dot black that fell between :20-:22, red for :22-:25, yellow for :25-:30 and green for :30-:35. We then added a clock marker in the corner, in this case :35. You then repeat this for every 5 minute increment until you have all 12 maps for your own Pokémon Go Tracker. This last step involves you creating a 200m radius ring TO SCALE that will act as your Pokemon range for your own Pokémon Go Tracker. How we did this is when we took a snapshot of the map in the above picture, we took a measurement of whatever the scale was in google maps in the bottom corner and extrapolated it to make a 200m radius (400m diameter circle) which is the current range of you Pokemon nearby. We also created a smaller 35m radius (70m diameter) circle in the center to represent our visible Pokemon range. We printed this out and traced it onto a transparency. Finally, if people find this beneficial and an app dev wants to take a stab at streamlining this Pokémon Go Tracker with an app, they are more than welcome too. (ie, an app where in find mode you drop a pin and it auto records the time you dropped it and you can fine tune the time by clicking on it once you know it, and then in track mode it automatically creates the time map based off the current clock time and shows the 200m radius ring and locks it in place from your initial position so you can see where all the spawn points are. We would say each person maintains their own unique map as their own Pokémon Go Tracker rather than a giant crowd sourced map to avoid trolls, but maybe there is a way to added trusted pins from friends to your map so you can build your maps with friends. And maybe a way to log what Pokemon you find to possibly determine which are rare spawns. Thanks to user ‘JTobcat’ for help creating this guide. We hope this little Guide for making your own Pokémon Go Tracker was helpful for you. If you have any questions or feedback, please feel free to leave a comment. 1 Comment on "How to make your own Pokémon Go Tracker (w/o violating ToS)"
are spawns specific to a certain rarity?